Remembering that you have so many events to attend to for the remaining part of the month is the best reason you need to use the sample save the ate bookmark template. 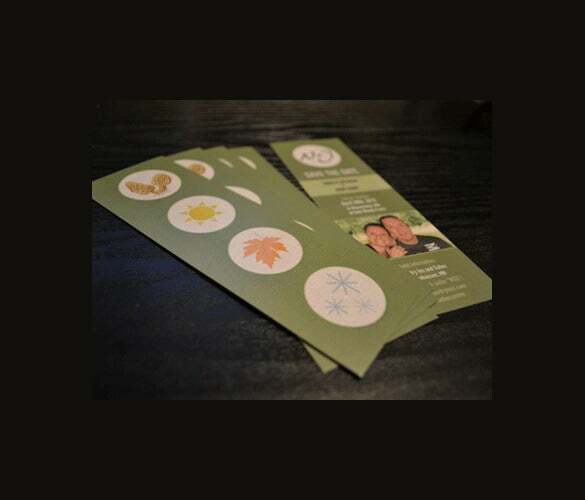 The free bookmark template was designed for people who often attend or plan and host events, helping them not skip an event as well as avoid all irregularities. 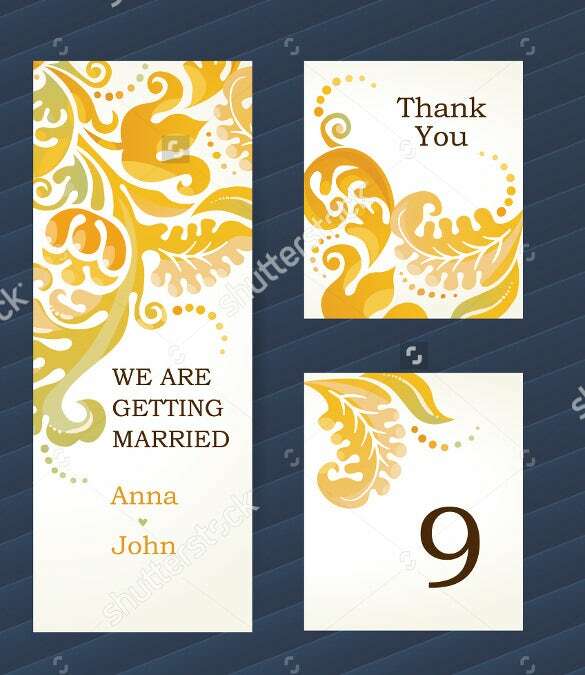 You can also see Photo Bookmark Templates There are many sample example ideas on how to use the template, but the most important thing to note is that they are used as shorthand reminders of the dates of events that will require your attention. Apparently, the Bookmark Templates can be downloaded for free from the internet. All you need to do is browse this page and download a template that captures your eyes. 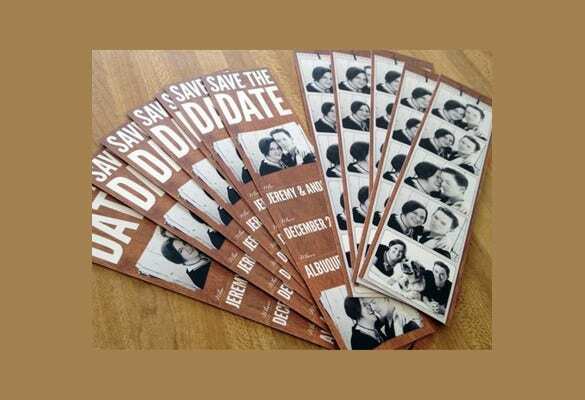 This vintage save the date bookmark template would make a truly classy bookmark for your save the date bookmark and both you and your guests are sure to love the mushy lines below. 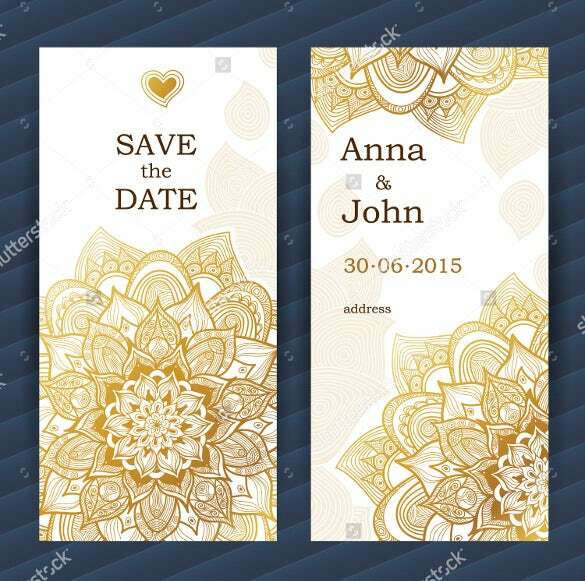 You are getting a very practical save the date bookmark template here that will allow you to upload a romantic shot at the center with information about the celebration at the top and bottom. 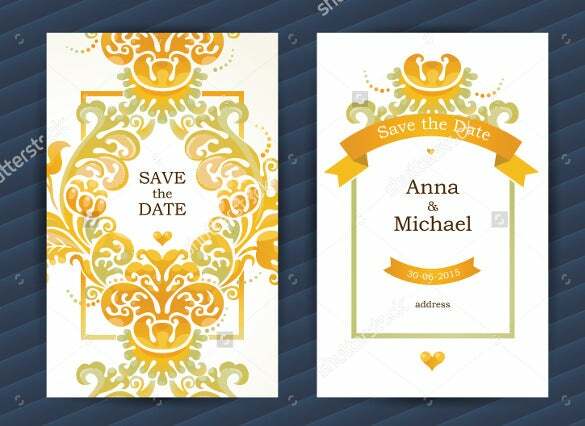 You have a bright selection of vintage wedding stationery templates here, including save the date bookmark, wedding bookmark and thank you card. The orange pattern looks gorgeous and so the archaic fonts. A wedding is anyday a fairytale event for a bride and when you have the rabbit from classic Alice in Wonderland announcing the celebration for you, the bookmark gets even more special. 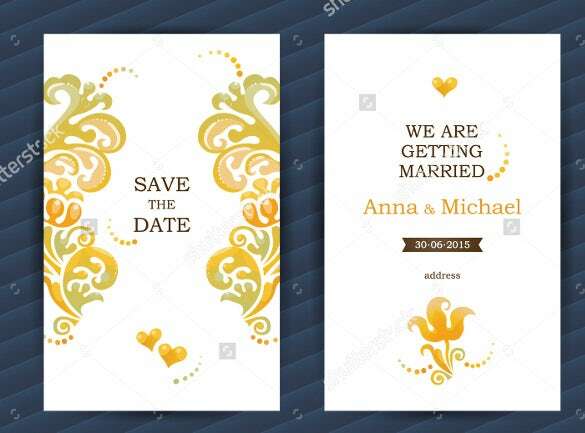 You are getting a beautiful save the date bookmark which will allow you to unfold the different moods of your lovely bond through a collage of several black & white pictures. 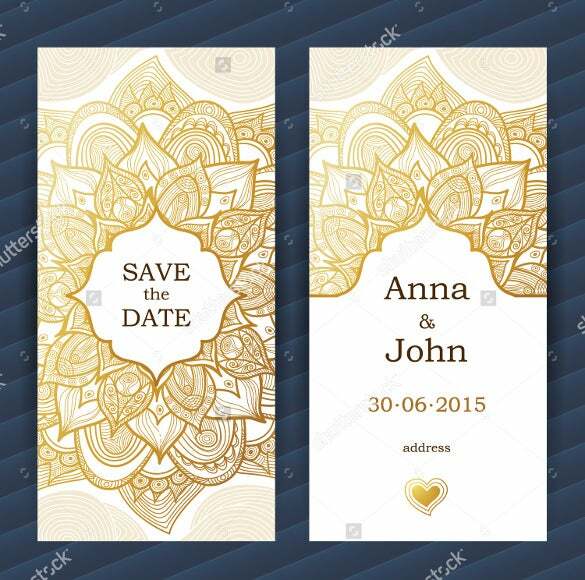 The golden feel makes a beautiful complement to a gorgeous celebration of a wedding and this bookmark template here with a bright golden flower at the fore, makes an amazing save the date card for you. 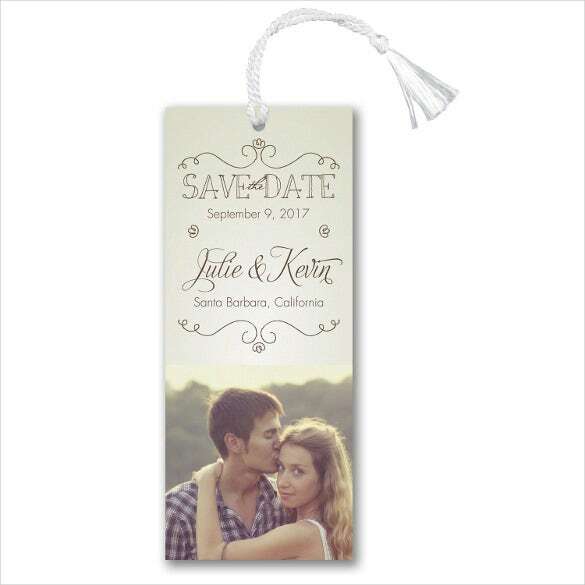 If vintage is the thing for you two, why not celebrate your classy taste with this retro save the date bookmark that speaks of retro with its faded picture and old country house. The bright golden flower beautifully illuminates the entire bookmark with its rich tint and ornate pattern. 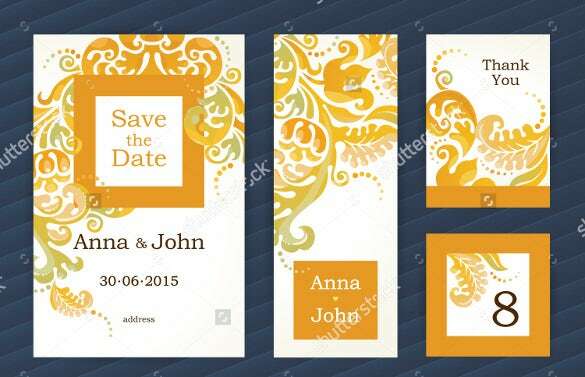 You can include the address of the celebration and name of the couple at the back. If you are looking for a minimalist save the date bookmark that doesn’t loser out on the aesthetic appeal and will even allow you to include a picture, this is the template for you. You will love the faded feel and archaic fonts. 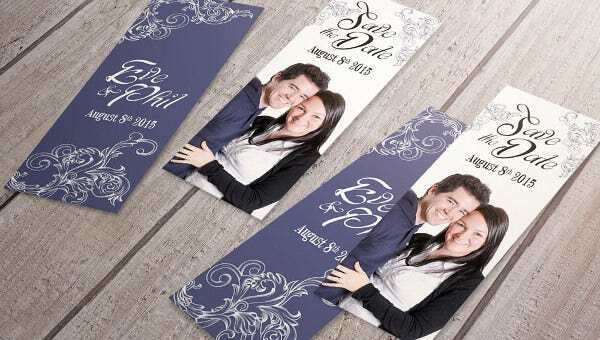 Starting with an amusing tagline, this save the date bookmark is sure to be a cherished keepsake both for the couple and their guests. The entire template comes up with a cute rustic appeal.